I’m not sure if Halloween ranks as my favorite holiday, but it’s definitely up in the top few. And the whole nature of Halloween lends itself to lots of good and spooky reading. Although horror or thrillers might come to mind first, there’s plenty of scary nonfiction to read as well. Below I’ve got a couple of old favorites and a few I haven’t read yet but am looking forward to this month. 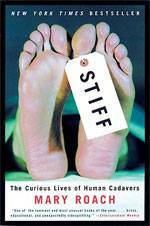 Stiff by Mary Roach is a really fun and sometimes gross book. In it, Roach explores what happens when a person decides to donate their body to science after the die. While many go on to be donors for medical school classes, others are used as crash test dummies, for decomposition studies, or other feats of science. If you have a bit of a stomach, this is a great book. And it’s Halloween connection? Cadavers are sort of like zombies, right? As a bonus, Roach also wrote a book on ghosts, Spook: Science Tackles the Afterlife, that I think would be totally appropriate on this list. I haven’t read Ghost Hunters by Deborah Blum yet, but I do know her well (she was a former professor), and have enjoyed all her other writing so far. Her most recent book, The Poisoner’s Handbook would do equally well on this list, as it explores the birth of forensic toxicology through murder and mayhem in Jazz Age New York. In this book, however, Blum explores looks at a group of scientists and intellectuals who, around the turn of the century, tried to close the gap between religion and science at a time when these pursuits were heading in different directions. I had big plans to read this book last Halloween, but alas, too many books and too little time. This year, Ghost Hunters and I are going to spend some quality time together. These are some of the real residents of Savannah, Georgia, a city whose eccentric mores are unerringly observed — and who dirty linen is gleefully aired — in this utterly irresistible book. At once a true-crime murder story and a hugely entertaining and deliciously perverse travelogue, Midnight in the Garden of Good and Evil is as bracing and intoxicating as half-a-dozen mint juleps. The book is sort of a conglomeration of types of narrative nonfiction – part travelogue, part profile, and part true crime – but manages to pull off every part successfully, resulting in a book that’s lush in scenery, broad in characters, and tinged with mystery and intrigue. So, so good. Right now, I am your crypt keeper and your Vampira. I am going to introduce you to monsters. I aim to give you unpleasant dreams. I’m turned into a bit of an October evangelist for Truman Capote’s 1966 nonfiction novel In Cold Blood, but honestly, that book is one of the scariest and creepiest pieces of nonfiction I’ve ever read. Capote writes about the murder of a prominent family in a small town in Kansas, committed by two recently-released felons for no real reason. Ralph F. Voss was a high school student in Kansas when he learned about the murders of the Cutter family in Holcomb. In his book, Voss considers In Cold Blood as a story, using literary analysis to explore the style and shape of the narrative. I’m utterly fascinated by thet idea of this book, since as much as I love In Cold Blood, I know very little about it outside the basics as a classic text of narrative nonfiction. My English-major heart is a flutter, and I am so ready to get my journalism-nerd on.